Here you are, having that last piece of desert or meal of the day. You’re tired and about to go to sleep (hint: without a wedge pillow). It’s been a long day and the last thing you need is some physical discomfort. Granted, you might have ingested a bit more than you can handle. But hey you’ve been able to handle it in the past. You jump into your pajamas, make your way into bed, grab your pillow, pull the sheets, lights off…and AH! Something is burning you from the inside out! It’s called acid reflux. The acid in your stomach is making its way back to your throat, and it hurts pretty bad. There are a lot of causes for why Acid reflux/GERD or heartburn happens. I won’t really go into the details here. What we’re concerned about is the fact that because of your posture in bed, the acidity in your stomach is making it’s way back up the esophagus or your throat. It happened to me quite often in the past and I’ve decided to write an article about it. On how to go about getting a proper acid reflux pillow, which is actually a wedge pillow that keeps you inclined during the night so the acid that is used for digestion stays where it’s supposed to. I’ll be reviewing 12 of the best bed wedge pillows that are conveniently available on Amazon. This review will cover all the price ranges available, and all different options available. Some of them are specifically designed for side sleeping, others are for general sleep and some are more oriented towards sleeping on your back. Some of the most convenient ones also uplift the whole bed so you can save on actually purchasing multiple pillows if more than one person is sleeping on the bed. Acid reflux, known medically as gastroesophageal reflux (GER), is common in the United States, and chronic acid reflux – or gastroesophageal reflux disease (GERD) – affects 20% of the nation’s population. Acid reflux occurs when the lower esophageal sphincter (LES) does not close properly and thus allows stomach acid to move back up into the esophagus, irritating its lining and causing discomfort. The telltale symptom of GERD is recurring heartburn, typically occurring more than twice a week to constitute gastroesophageal reflux disease and not just reflux. However, not every person affected by GERD experiences heartburn; they may also experience nausea, vomiting, dental erosion, and bad breath. While Categorized as a digestive disease, GERD is often regulated foremost by changes in diet to include less acidic foods. Eliminating such things as chocolate, citrus, garlic, and tomato products, among others is recommended. However, other physiological factors can also induce symptoms of GER(D). Spinal health, for instance, affects every other facet of physical health. According to Nobel Prize winner Dr. Roger Sperry, “90% of the stimulation and nutrition to the brain is generated by the movement of the spine.” A misaligned spine can lead to serious pain in the neck and back, as well as inhibit organ function. This impaired organ function can then lead to acid reflux, among other plights. Proper spinal alignment is imperative to an optimally functioning body. Subluxations, or spinal misalignments, can put “unnecessary and often detrimental amounts of pressure on the delicate nerves coming out of the spine.” Extra nervous pressure can easily impede proper organ functioning, such as in the stomach. Specific subluxations in the lumbar and thorax areas of the spine can actively displace the stomach, which may result in a hiatal hernia. A hiatal hernia occurs when the “top part of the stomach pinches through the diaphragm muscle,” resulting in acid reflux. Thus, the connection between spinal health and acid reflux is firmly supported, and it is important to take these issues seriously and perhaps even preempt them. Natural remedies for acid reflux are becoming increasingly available, including chiropractic care, which can help your whole body function better. One simple, at-home measure for sufferers of GERD is to invest in a wedge pillow, which employs the benefits of chiropractic treatment while you sleep, helping to restore proper alignment to the body while simultaneously eliminating symptoms of GERD in a natural, effortless way. Whether the acid reflux is caused by malnutrition, obesity, pregnancy, spinal subluxations, or other physiological factors, a wedge pillow provides a natural remedy during slumber. A wedge pillow is an elongated, ramp-like pillow that will physically adjust your sleeping position so that the head is elevated in comparison to the hips and feet. This employs gravity in keeping the esophagus positioned above the stomach, preventing the backflow of bile that can irritate the esophagus lining and result in uncomfortable heartburn. 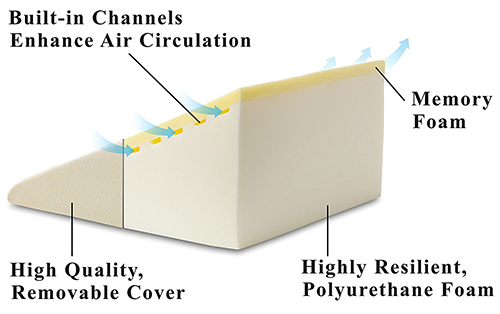 As an added benefit, the incline of a wedge pillow may also help to alleviate sinus congestion and snoring or symptoms of sleep apnea in the process. However, simply piling pillows at the head of the bed is not a comparable solution, as that can affect spinal health in the neck which may, in turn, create further subluxations. A proper wedge pillow, on the other hand, will also do what a good mattress should do: keep your spine in alignment (or help to restore its correct alignment) and thus prevent any harmful subluxations that may worsen acid reflux symptoms or even merit surgery down the road. Researchers at Cleveland Clinic have delved into the specifics of wedge pillow success. The short version: Yes, a wedge pillow helps! Those who participated in their two-week study showed “significant improvement in symptoms of heartburn and regurgitation,” as well as “sleeping better and not being as irritable or tired the next day.” What you may not know is a research-proven secret: One side is better than the other. 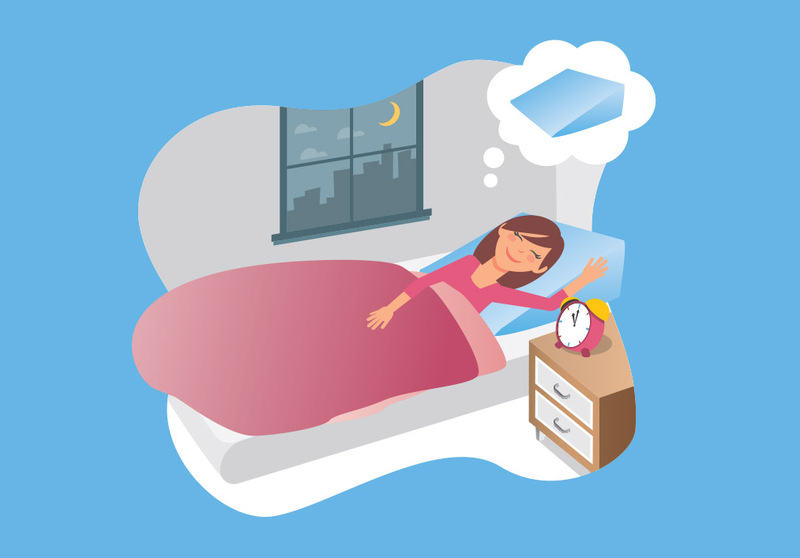 The Cleveland Clinic found that sleeping on specifically the left side proved the most helpful. It “separates food and acid from the valve,” keeping it further from the sensitive esophageal lining. Sleeping on a wedge pillow on your left side may, therefore, eliminate any symptoms of GER(D), all with pretty minimal effort other than choosing and purchasing a wedge pillow or bed wedge. Finding a good wedge pillow can also save you costly payments for acid reflux medications. These medications may also be laden with side effects that rival or are even worse than acid reflux, such as diarrhea, constipation, fatigue, and increased susceptibility to bone fracture. Also, medications often are dangerous or completely prohibited for women who are pregnant or nursing. A wedge pillow, by contrast, is an easy and natural solution that can be used by virtually everyone. A wedge pillow uses only gravity to help lessen your symptoms, as opposed to potentially harmful chemicals and hormones with unpleasant side effects. There’s no telling how long you would need medication or how many different medications you would go through to find one that works, or even if any of them would work after putting your body through such rigors. Your body will never develop an immunity to gravity, so the wedge pillow is a viable, natural, and long-term solution with virtually zero side effects – in fact, it may improve your quality of life in more ways than one. Therefore, selecting the right wedge pillow is imperative for not just acid reflux relief but overall health, as well. It may also have additional health and lifestyle benefits, enumerated in the next section. How much money can I spend on a wedge pillow? Is it worth the price? How high of a slope can I comfortably sleep on? Does the wedge pillow hit my torso in the appropriate place so that I feel supported and aligned? Will I still need to use another pillow on top of this wedge pillow? And will the wedge pillow induce tension in my neck? Will the width of this wedge pillow be appropriate for my sleeping habits? Would I need two? Is the material or cover of the wedge pillow comfortable? Will I need an additional layer? Can the wedge pillow be used under a mattress as well as on top of it? Do I need to travel with this wedge pillow? How often? Does the wedge pillow come with a washable cover or another case? Is the texture/firmness of the wedge pillow vastly different from that of my mattress? When shopping for a wedge pillow, it is important to go into the process knowing which of the above features are most important to you. For example, if you don’t travel much, the weight of the wedge pillow may not have much bearing on your decision. It is also definitely worth deciding beforehand how much you are willing to pay for your preferred features. Naturally, a higher priced wedge pillow tends to be made of a higher quality material, which will affect the support and durability of the pillow, although it is not impossible to find a quality wedge pillow for less than top dollar. Remember that you will be using this wedge pillow every night, so it may not hurt to give yourself a somewhat flexible budget to make the investment worthwhile. It is also worth noting that sleeping on a wedge pillow will take some adjustment. That period of adapting can take anywhere from a few nights to a few weeks. You might already have an inclination of how long it may take you, based on how quickly you fall asleep, if you’re someone say, that “can fall asleep anywhere,” etc. It can also be largely dependent on the degree of the incline. A steeper slope on a wedge pillow may take longer to get used to, whereas a slighter and more gradual slope may only take two or three nights. Some pillows may also impede your ability to toss and turn, which can mean either a more restful night’s sleep or one sore side if that’s your reason for turning throughout the night; however, some are designed specifically for side-sleepers and will hopefully result in a deeper and more comfortable sleep. As a wedge pillow with a steeper incline than many of its competitors – not to mention an Amazon #1 Best Seller – the InteVision Foam Wedge Bed Pillow may be the perfect pillow for those with particularly severe GER(D) symptoms. Its thick, structured foam provides spinal support as well as upper body elevation – and for a comparatively low price. The InteVision wedge pillow is only $39.99, which is a relatively low price for a pillow with a memory foam layer (note that the Avana SuperSlant, which has the same feature, runs around $200); the dual-foam layering will ensure both proper positioning and comfort. The slope of the pillow is also higher than that of many other pillows, which typically range from 5 to 7 inches. This is also a one-person pillow, so if you share a bed with a partner who does not need or want a wedge pillow, this will keep the adjustment to your side of the bed (so long as the pillow stays above the mattress and not under it). The material is also hypoallergenic. Unlike some other pillows that come in an array of sizes, the InteVision pillow is only one size and would work well for someone with a twin bed but not necessarily for someone with a full, queen, or king bed who tends to roll around. Some customers have also found the pillow to be too stiff or have had difficulty sliding down it due to the steepness. Depending on your height, you may also find the length of the pillow uncomfortable, as it can hit anywhere between ribcage and hip. There is also no warranty specified. 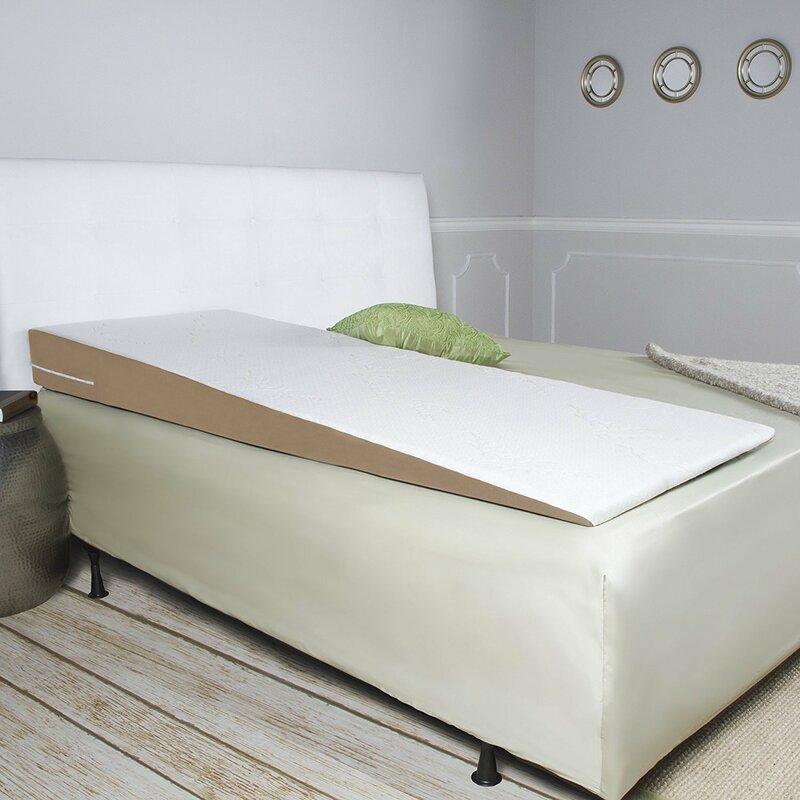 If you are looking for a cheap but sturdy wedge pillow, the InteVision Foam Wedge Bed Pillow may fit your needs nicely, depending on your bed size and situation. It may also be a good choice if you often read in bed, as the more severe incline keeps you upright and supported. The company also sells a pillowcase separately, which can eliminate the need for creative sheet-wrapping as some other pillows may necessitate. The Cushy form bed wedge pillow, can serve many purposes. It’s firm and soft at the same time. It has a memory foam top while at the same time being firm. Customers are praising this wedge pillow. The owners of the Cushy form wedge pillow are very comfortable able to use it for side sleeping. By using an extra pillow on the top it becomes very comfortable because of the memory foam. The Cushy Form wedge pillow is a good all-around wedge pillow. It can be used for neck & spine sport as well as for acid-reflux. Well made and of good quality. It has about an inch more width then the other wedge pillows out there. While it’s not a lot i does give you more leeway. A lot of people are complaining about sliding down. Some people are also complaining about returns. One the package is opened, it puffs up. The pillow is originally send under vacuum and after opening it it becomes difficult to return. This wedge pillow from Brentwood stands out from its competitors in one important way: it allows you to choose the height. This customization, along with its included cover and moderate pricing, may make it a top contender, depending on your needs. However, some have found the pillow to be short or firm. Unlike many other brands, Brentwood allows you to choose the height of your wedge pillow – 7 inches, 10 inches, or 12 inches – which allows you some control over adjusting to the incline and matching the incline to the severity of your symptoms. All of the available heights are above the recommended 6 inches, so whichever seems most comfortable to you should work. The Brentwood pillow also comes with a bamboo fiber cover and is relatively inexpensive compared to some competitors. Some other pillows have an extra layer of memory foam, although this Brentwood pillow does not. Some customers also found it to be too firm to sleep comfortably or too short on their torsos. There is also no warranty specified, although it may be indicated in the packaging. Depending upon the severity of your GER(D) and spinal manifestations, any of the three available heights may work for you. It is also much more affordable than some pillows without sacrificing quality, although you may miss the memory foam layer that competitors offer. 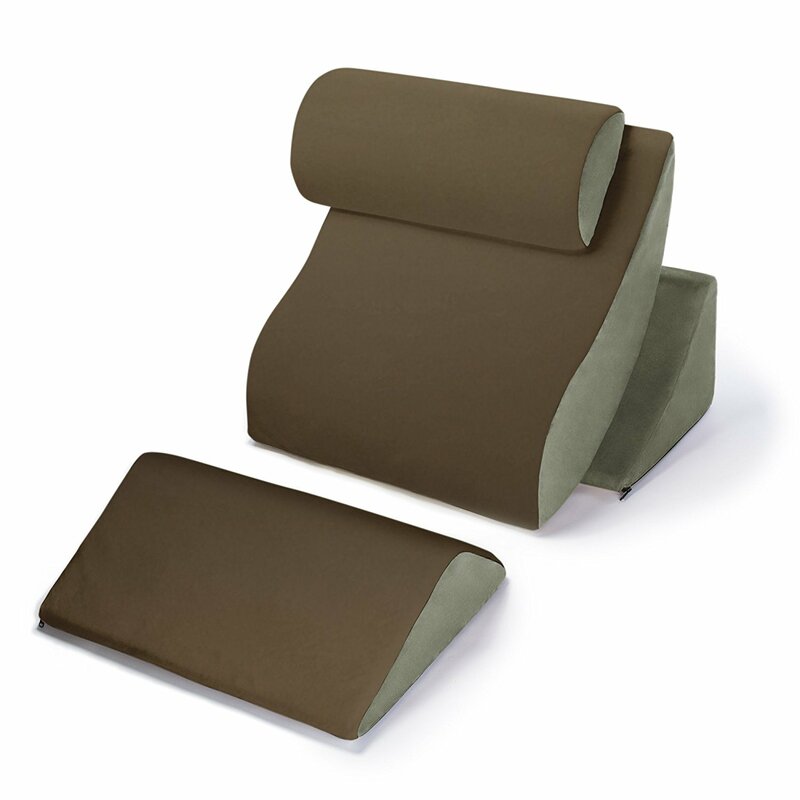 Featured in several publications such as The New York Times and SELF, the Medslant Wedge Pillow is torso length and foldable, making it additionally useful for those who travel often. The pillow also has a fairly steep incline that contains gentle ridges which help prevent sliding during the night. However, some users still reported sliding and difficulty sleeping. This Medslant pillow folds in half, so any sufferers of GER(D) who frequently travel may find this a desirable feature. The pillow also comes with an allergen resistant cover, which is helpful whether traveling or not. As for the pillow itself, it is torso-length and therefore provides a more natural incline (unlike some wedge pillows that end around the ribcage). 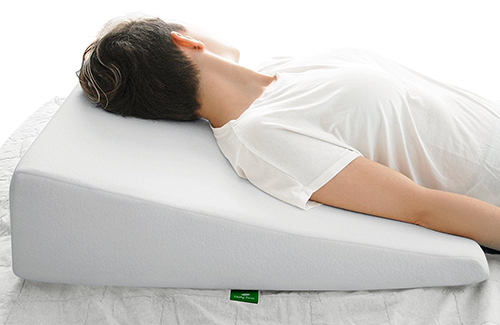 The foam composition of this wedge pillow is softer in comparison to some other competitors, which can cause spinal discomfort and difficulty sleeping. It can also be more difficult to use this pillow between the mattress and box spring, as it may compress more easily than some made of firmer foam. Additionally, some have found the included case to be unpleasant and rough. There is also no warranty specified, although it may be indicated in the packaging. The Medslant Wedge Pillow is a traveler’s dream, although it may not be as comfortable or supportive as some of its competitors. However, if you’re looking for something on the cheaper end that still has a significant incline and have an extra $100, the Medslant may be worth testing. The Avana Contoured Support Pillow is firmer than many other elevation options, so if you have a firm mattress and want to feel that same level of support in your wedge, this is a great option. The incline is relatively moderate – an 8-inch maximum height, which is between the 5- to 12-inch range typical of wedges; however, it is just steep enough that you may experience some sliding. This contoured pillow is longer than most standard wedge pillows, which tend to end around the ribcage or waist; this pillow therefore has more surface area, which means more support for your spine for about as much money as a typical wedge pillow would cost. You can also still use the pillow of your choice on top of this support pillow, giving you the comfort of your own pillow as well as a little more lift. 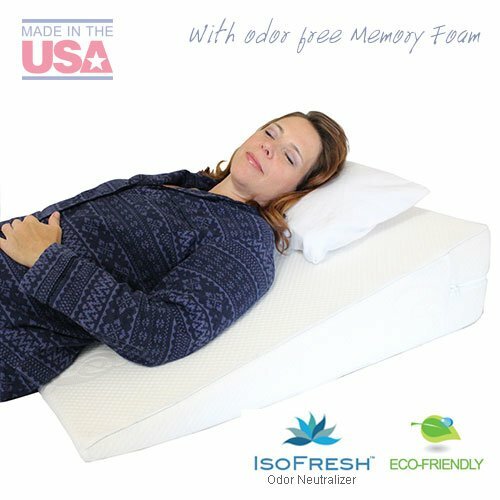 This contour pillow is also comfortable for sleeping on your back or side, depending upon your preference, and many customers happily reported freedom from GERD symptoms. Some shorter customers have found the length of the wedge to be slightly awkward, which may create pressure in the hips. Many have also reported sliding down throughout the night, and some have found the pillow to be too firm. There is also no warranty specified, although it may be indicated in the packaging when shipped. While most wedge pillows are simply triangular, but the Avana Contoured Support Pillow is ergonomically designed to provide maximum support and alignment. which will be especially enticing if you tend towards firm mattresses. You might experience some sliding, but you will have to decide if that is a worthwhile price to pay for GERD relief. The Avana SuperSlant Bed Wedge Pillow boasts a 7.5-inch height, creating maximum elevation for sufferers of nighttime acid reflux symptoms. It can be used on top of the bed or between the box spring and mattress – whichever you find most comfortable. As it does span the width of the bed, this wedge pillow may or may not be right for you, depending on if you share your bed with a partner and whether or not he/she finds it useful or comfortable. The incline is quite steep and therefore allows for excellent upper body elevation. Additionally, the pillow is made of polyurethane foam with an additional 1-inch layer of memory foam on top. This will not only help you stay comfortable in the night but will also provide sturdy yet uniquely cushioned support for your spine, enhancing your spinal health. If you share the bed with a partner who also suffers from GER(D), this wide wedge pillow is basically two pillows for the price of one and may, therefore, save you some money in the long-run. The pillow also comes with a soft, machine-washable bamboo-rayon cover. Due to the steeper slope, it may take you a few nights or weeks to adjust to this pillow, particularly if you are a side-sleeper. The size also makes using a pillowcase or fitted sheet difficult, although you can easily wrap a flat sheet around the pillow if desired. If you share a bed with a partner, he/she will also need to adjust, as it does span the width of the bed. Additionally, this is a heavier pillow – 17 pounds – so traveling with it wouldn’t be as easy. There is also no specified warranty, although it may be indicated in the packaging. Although the pillow is almost $200, it spans the entire width of your queen- or king-sized bed which would normally require two pillows; the Avana SuperSlant may be more economical if you require a wider pillow or multiple pillows. The significant incline and extra memory foam layer make this pillow both useful and comfortable, and if you are willing to adjust to it, it may be the right choice. By now we know that Avana is known for their quality products, and this full-length bed wedge is no different. What is different about this bed wedge is that, although it’s mattress length, it is only half the width of the bed; this means that it must be used on top of the mattress rather than under it, as is typical for other bed wedges. This Avana wedge is ideal for someone looking for a full bed wedge but who doesn’t wish to disrupt their partner’s side of the bed. 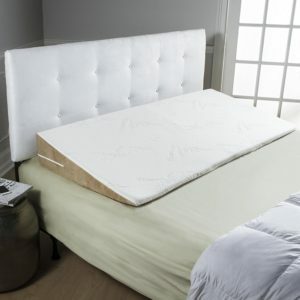 Because it matches the length of the mattress, your whole body receives the same amount of dual-foam support. You may even be able to use the half-queen on a full or twin bed if you have your own bed, although the fit may not be perfect. 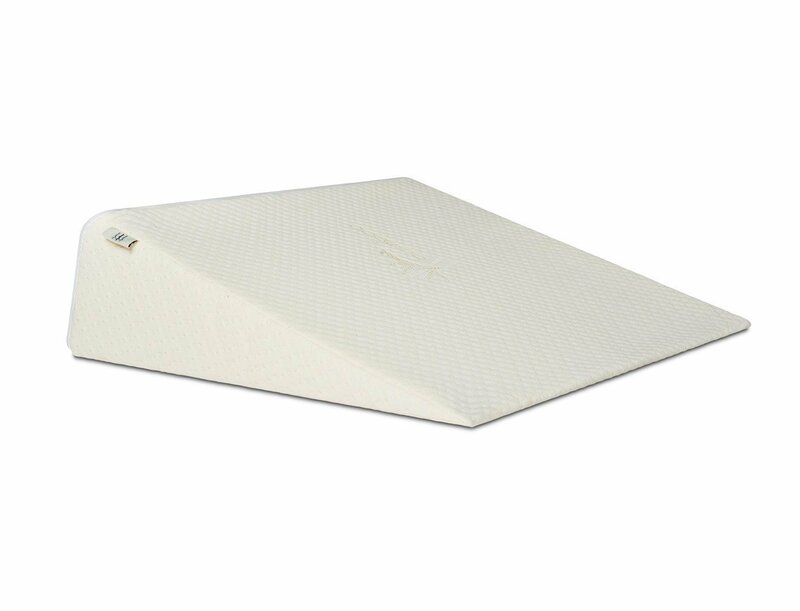 The plush, antimicrobial bamboo cover is also removable and machine-washable. Unlike a typical bed wedge, this Avana wedge cannot be used under the mattress, as it only spans half the width. This means that you will likely have to sleep on the wedge itself, unless you wrap it in something else; the cover is not necessarily hypoallergenic. It is also quite large, so traveling with this wedge may be difficult. There is also no warranty specified, although it is indicated in the packaging when shipped. If you’re looking for a full-length bed wedge that won’t disturb your partner from a reputable manufacturer, the Avana SuperSlant Full Length Bed Wedge may be the answer. However, if you sleep by yourself and have a queen- or king-sized bed and tend to roll around, it may instead be wiser to get a bed wedge that spans the width of the bed as well as the length. This Avana Kind Bed Orthopedic Comfort System is an all-encompassing four-piece support system. It consists of the back scoop, or chair-like back for spinal support; the scoop cradle, which fits below the back scoop; the headrest, which attaches to the back scoop; and the knee rest, for keeping the legs resting gently with full circulation. This Avana set is extremely sturdy, which will provide optimal support and elevation. Each individual pillow works together with the others to hold you in a fully supported – but still comfortable – position. However, you may be able to use a piece individually, like using the knee rest or perhaps even scoop cradle with your favorite pillow to achieve a simple wedge effect. Each piece also comes with a plush removable cover in the color of your choosing; the colors available are all relatively earthy, so there’s a good chance the system will match your bedding. Avana clearly spent time on the aesthetic of this pillow system, so you won’t even feel like you have to hide it. This is a bulky multi-piece system, so traveling with it may be difficult. There is also really only one option for height if you construct and use the system as recommended, and it keeps you almost entirely upright, which may be difficult for falling asleep. It is also on the pricier side (however, you do get a lot of pieces). There is also no warranty specified, although it might be indicated in the packaging. Although the Avana Kind Bed Orthopedic Comfort System is a high-quality product, it might be better for reading or watching television in bed as opposed to actually sleeping. However, if you can easily sleep upright, you’re guaranteed a well-supported night’s sleep if you spring for this system. Needless to say, this is the Rolls Royce of bed wedge pillows. It has all the necessary options to lock you in place for a full night of acid-reflux-free sleep. Medcline states that the system is validated by 5 different independent clinical trials. In other words, they’ve done their research to see what works best and they have proof to back it up. These trials, as per their statements are able to confirm an 87% reduction of the harmful stomach acid that makes its way back into your throat. That’s a pretty good amount. Honestly, I’m all for natural cures, and if I’m able to pass a full night with barely any reflux without taking any medication, that’s a huge advantage for me. There’s an amazing feature: it’s flat on top! so your head sleeps flat. Now, i cannot express how important the next point is. NO Sliding down. the fact that you can insert your arm into the pillow and it locks you in place is a HUGE advantage. Ask me how many times i’ve ended up in fetus position at the bottom of the pillow, or even bed! Many. So gain this is the only pillow in all our selection that has this option. For me personally it’s a make or break tupe of specification that really makes all the difference. Why so important you may ask? because it allows you to keep the position all night, 8 hrs+ . Not that 2 hours into the night you wake up because of your heartburn due to ending up at the bottom. Another great option is the Theraputic body pillow that comes as an addon. 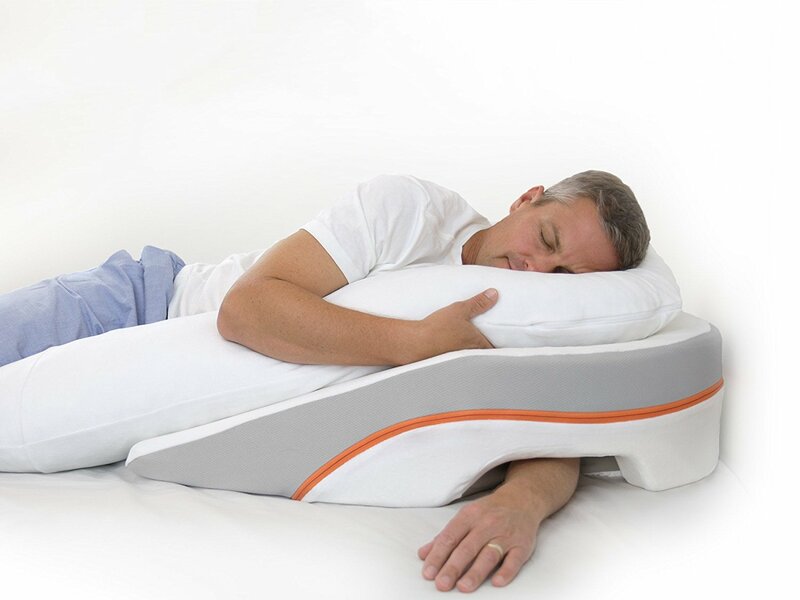 this pillow fits in between your legs and allows for proper posture during sleep. And since it’s u shapes, it really stablizes you for a solid night of sleep. 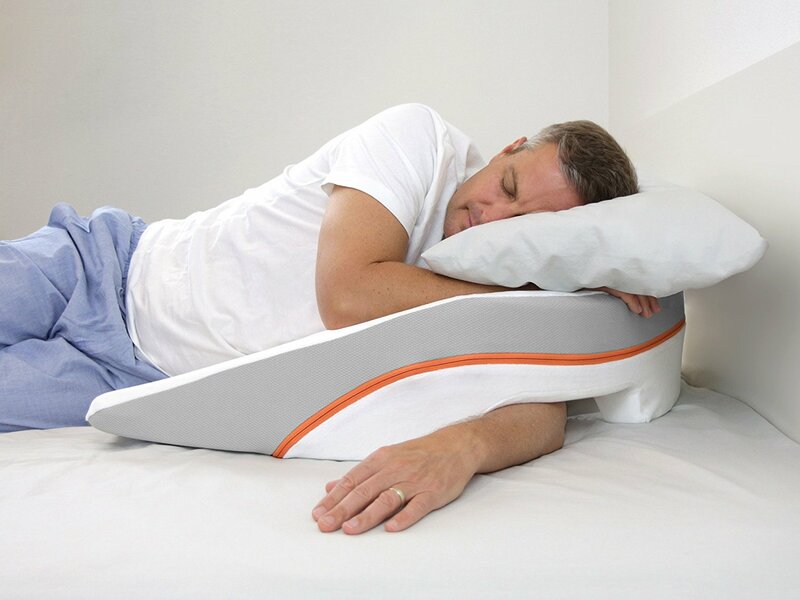 No more waking up to adjust your pillows. There’s even a Internal insert pillow to regulate the arm. By now, you should be getting the picture that customers rave about this advanced acid reflux relief system, which is comprised of three pillows. It has the main structural pillow, complete with a tunnel underneath for your arm to slide through; the insert pillow to support the head; and the therapeutic body pillow, which cradles the torso and provides extra support from both sides of the body. This is the perfect system for someone who sleeps on his/her side (and the same side) all night, although they caution those with severe hernias and other lower back subluxations due to the rather sever incline. This “pillow” has so many options that it really allows you to find a sleeping position what you’re comfortable in, making sure you do not move from that position during the entire night of sleep and relieving you of many bodily discomforts. For starters, you can select the pillow that was specifically designed for your height and weight. The small fits those 4’8” – 5’3”, the medium 5’4”-5’8”, and the large 5’9” – 6’2” with a 250-pound weight maximum. The MedCline system boasts an 87% reduction of reflux, as compared to regular wedge pillows. It is also made of four different medical-grade foams that conform to the body to provide superior support, and the patented shape helps you stay put and avoid sliding down all night, especially because your arm goes through the pillow. If you have wide shoulders and when you sleep with not enough pillows between your ear and end-of-shoulder one tends to wake up with pain in the collarbone. Also, this will virtually eliminate “sleeping” arms. It actually hurts when your whole arm goes numb because of an improper posture in which you had cut off the blood circulation to your whole arm. This system may be especially beneficial for pregnant women, as it provides more support than a standard wedge due to the wraparound therapeutic body pillow. Additionally, the underside tunnel can help relieve pressure from the side on which you sleep (MedCline recommends the left side). The included cover is also machine washable. Perhaps the most obvious con is that this an expensive elevation system; if it ends up not working for you, it may be over $300 down the drain. Its multiple pieces also make it difficult to travel with this particular system. Additionally, you may not love it if you tend to switch sides during the night or sleep on your back. It is not meant for use underneath the mattress. There is also no warranty specified, although it may be indicated in the packaging. In short, if you’re a side-sleeper who prefers to sleep on his/her left side and doesn’t have any severe lower back injuries, the MedCline pillow system is a heaven-sent solution. However, if you toss and turn or are on a budget, this may be a little harder to justify. For a similar side-sleeping experience with the freedom to use your own pillow, the MedCline Advanced Positioning Wedge Pillow is an excellent variation of the whole system (and $100 less!). It offers the same great support and patented anti-slide incline, just without the wraparound body pillow. This is essentially a two-piece version of the MedCline system. You get the same patented technology and side-sleeping advantages, such as the ability to slide your arm through and relieve downside pressure. It also elevates the entire torso to increase comfort and reflux-fighting ability. You can also continue to use your own pillow on top of this wedge. Additionally, there is a 60-day warranty, allowing you a trial period to be sure you love it. This pared-down version does not come with the therapeutic body pillow, which provides extra support. It is also still on the expensive end and may not be ideal for traveling due to its size and irregular shape. There is also no warranty specified, although it may be indicated in the packaging. Designed especially for the reflux-prone side-sleeper, the MedCline Advanced Positioning Wedge Pillow may be a worthwhile investment, particularly if other, more standard wedge pillows have failed you. However, if you have the extra $100 to spare, you may just want to spring for the entire system and really get the full MedCline benefits. Thickness: Is the height of the wedge pillow appropriate for your symptoms? Does the bottom edge of the wedge pillow create an uncomfortable ledge? Slope: Is the incline of the wedge pillow enough to be effective? Is it so steep that you will slide down it while sleeping? Texture: Is the material scratchy or uncomfortable? If so, can you avoid making contact with it easily (placing it under the mattress, pillowcase, etc.)? Firmness: Will the wedge pillow provide the appropriate amount of support? Is it too firm and therefore uncomfortable? Width: Is the wedge pillow the right width for your bed? Will it affect your partner, if you share a bed? Weight: Is the wedge pillow heavy or easily portable? Price: How much are you willing to spend for a wedge pillow? Which one has the most desirable features for the best bargain? Hypoallergenic: Is there a chance you will have an allergic reaction to the material (of either the pillow or cover)? Will my face/body even touch the wedge pillow or cover, or is it used under the mattress? Of course, not all of the above criteria will be important to you – perhaps you don’t travel often and therefore don’t need to worry about the weight as much. Beyond those main measures, you should also consider the additional features and how much you value them. For instance, many of the pillows feature a memory foam top layer or plush cover. Remember that more than mere elevation is important. You want to be sure that your spine is kept in line and supported to avoid any future issues that could negatively induce acid reflux or other health problems. Memory foam will also enhance something very important: your level of comfort! Keep in mind that something may be high-quality but still not very comfortable, and having a comfortable pillow or wedge is paramount in getting a good night’s sleep! This wedge pillow allows you to choose your optimum height and comes with a plush, removable cover – and it’s under $50, making it more affordable than many other options but still giving you luxuries and customizable options. Available in multiple sizes depending on your height and weight, this full-fledged wedge pillow system has thought of it all: a wraparound body pillow, an arm opening for shoulder relief, and a sturdy, high-quality construction. It also encourages side-sleeping (particularly on the left side), which we know additionally helps to relieve acid reflux symptoms. It does come at a cost however. Be prepared to pay a premium for premium features. The Medslant 2 took feedback from the original Medslant wedge pillow and made some adjustments without increasing the price. It also has a memory foam overlay and washable cover included in that fixed price. The Avana SuperSlant Full-Length Bed Wedge is one of few wedges of its kind, where the sleeper gets full-body support without affecting the entire bed (if the bed is larger than a twin-size). This is ideal for someone who wants full-body support without disturbing his/her partner; just be sure to use it on top of the mattress, as placing it under the mattress may create an uncomfortable – and ineffective – tilt. Due to the steeper elevation of this comfort system, it keeps you almost completely upright. It, therefore, supports your spine while keeping you somewhat reclined – a perfectly relaxing position for reading or watching television in bed (or even on the floor!). These suggestions are based upon the detail provided previously. However, only you will ultimately know whether or not a wedge pillow is right for you. Here may be other questions that arise along the way, but above all remember to make yourself the priority. You deserve relief from painful acid reflux, and following the guidelines above will lead you to a better pillow, a better night’s sleep, and better overall health. I’m impressed, I must say. Seldom do I encounter a blog that’s equally educative and amusing, and let me tell you, you have hit the nail on the head. The problem is something that too few folks are speaking intelligently about. I’m very happy I found this in my hunt for something regarding this.